Major news publishers are reaching new heights in terms of mobile readership. 55% of all time spent on publishers’ websites are now on phones, a 40% bump from the previous year. However, revenue from mobile advertising accounts for less than 20% of overall ad revenue. And with daily print circulation lower than in was when around 10% of the country couldn’t read words, publishers need to find a way to keep that revenue up. Many of the primary issues with mobile advertising stem from traditional formats not performing. As it is, nobody likes mobile banner ads. Most of the people that click on banner ads didn’t even mean to. Sponsored native content is becoming more and more prevalent, but can still be seen as problematic to objectivity in reporting. Recently, Facebook partnered with a small group of publishers to create “Instant Articles.” they will be published natively and 70-100% of the ad revenue will go to the publisher, rather than Facebook, who, in case you were wondering, isn’t so worried about mobile advertising. 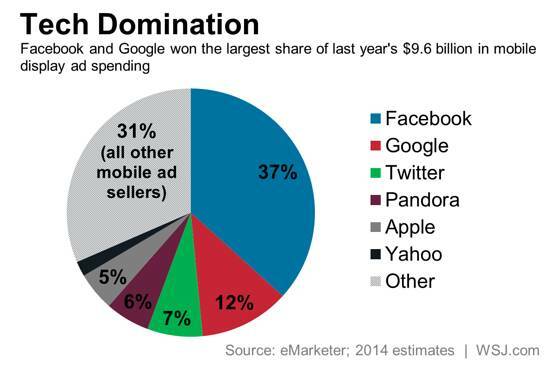 (Facebook ad revenue makes up a cool 37% of all mobile ad spend). In case you missed it, Foursquare no longer gives users the mayoral titles. In the fall of 2014, they changed up their offering to a search and discover app in a similar vein to Yelp. Their check-in service was built into a new app called Swarm – there you can become mayor of your local Taco Bell, if you so wish. While Foursquare has only a third of Yelp’s active user-base, it’s still proving to be a powerful underdog in the search and discover world, primarily through their highly specific location and preference data they have amassed. Foursquare’s geolocation data is extensive and is being utilized by Twitter, Microsoft, and AT&T, among many others. Their data is a big selling point for Foursquare as they look to monetize further. Curious what can be done with it? Check out a few experiments Foursquare created with Mapbox, exploring each state’s most unique flavor and most popular vice. Desktop audience data is a growing industry, with an increasingly robust and accurate offering. The same cannot be said of mobile audience data, which is much more difficult to verify. Enter PushSpring, the leading independent provider of verified mobile app audience data. Their proprietary data is now available in bucketed personas for targeting across Oracle Blue Kai Audience Data Marketplace. What’s pretty cool (or kind of creepy, depending on how you look at it) about PushSpring is that its device-level personas define demographic details, intent, interest & activity, and life stage all from the apps a person has on their device and the way they use them. Ultimately, PushSpring’s data can be layered on top of a blanket mobile buy to reduce wasted spend and drive action. Check out more about PushSpring Personas here. 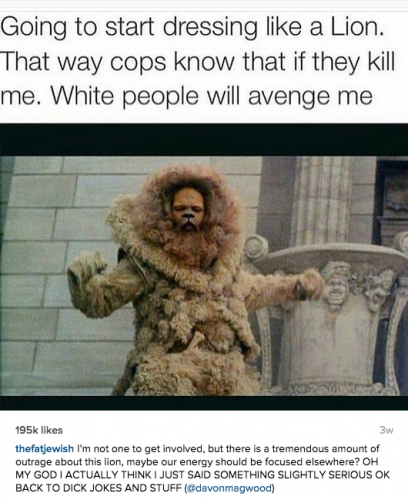 Josh Ostrovsky, aka @FatJewish, has finally been called out for making loads of money off other people’s jokes. This past Sunday, Ostrovsky finally addressed the controversy. In response to the outrage caused by Target’s switch to gender-neutral toy sections, a Facebook troll took matters into their own hands, responding to comment on behalf of the discount megastore. 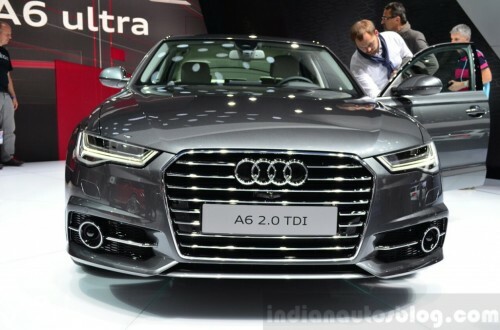 Audi of India launched their brand new A6 Matrix via social chat platform WhatsApp. The three minute video was the first look at the features and design of the new model.